CAROLYN HELMAN LICHTENBERG CREST AWARD – International Winner – Joanie Amacker Haley – This award is presented to distinguished individual alumnae honored for outstanding personal achievement in the areas of either community service or professional achievements. EVELYN PETERS KYLE ANGEL AWARD FOR CLUB SERVICE – Nominee – Suzanne Skipton Shelton – This award is given to an alumna who is recognized for having performed those duties that often go unrecognized but has enhanced the success of an alumnae organization. EMMA HARPER TURNER LEADERSHIP AWARD – Nominee – Melissa Garlington – Awarded to an individual alumna whose exceptional leadership has contributed to the success of her alumnae club at the local level. YOUNG ALUMNAE ACHIEVEMENT AWARD – Nominee – Shelby Edmoundson – This award is presented to an individual alumna who has graduated college within the last 15 years, who has demonstrated that lifelong commitment to Pi Phi through their involvement in their local alumnae club. Congratulations to our own Joanie Amacker Haley! REGION 4 CLUB OF EXCELLENCE - Awarded to clubs that successfully perform the Criteria of Excellence. REGION 4 EXCELLENCE IN COMMUNICATION AWARD WINNER - This award promotes and recognizes outstanding communication within an alumnae club based on internal and external communication. CAROLYN HELMAN LICHTENBERG CREST AWARD NOMINEE Stacey Gillman Wimbish – Crest Award Nominee for Professional Achievement - Distinguished individual alumnae are honored for personal achievement in areas of community service or professional achievements. EVELYN PETERS KYLE ANGEL AWARD FOR CLUB SERVICE WINNER Kathleen Dooley Boles – Houston Alumnae Club Nominee and Region 4 Award Winner - An alumna is recognized for having performed those duties that often go unrecognized but serve to enhance the success of an alumnae organization. EMMA HARPER TURNER LEADERSHIP AWARD CLUB NOMINEE Amy Wharton Vanderhill - Houston Alumnae Club Nominee - Awarded to an individual alumna for exceptional leadership that contributed to the success of her alumnae club on the local level. YOUNG ALUMNAE ACHIEVEMENT AWARD NOMINEE Shelby Edmoundson – Houston Alumnae Club Nominee - This award is presented to an individual alumna who has graduated college within the last 15 years. The young alumna has become an active Pi Phi alumnae member and demonstrated that Pi Phi is a lifelong commitment through their involvement in an alumnae club. PREMIER CLUB 1st Runner Up - Awarded to a club as representative of performance that is exemplary above all others. CAROLYN HELMAN LICHTENBERG CREST AWARD NOMINEE Jolyn Scheirman – Crest Award Nominee for Professional Achievement - Distinguished individual alumnae are honored for personal achievement in areas of community service or professional achievements. EVELYN PETERS KYLE ANGEL AWARD FOR CLUB SERVICE NOMINEE Amy Wharton Vanderhill – Houston Alumnae Club Nominee - An alumna is recognized for having performed those duties that often go unrecognized but serve to enhance the success of an alumnae organization. EMMA HARPER TURNER LEADERSHIP AWARD CLUB NOMINEE Elizabeth Hoover Rotan - Houston Alumnae Club Nominee and Leadership Award Region 4 Winner - Awarded to an individual alumna for exceptional leadership that contributed to the success of her alumnae club on the local level. YOUNG ALUMNAE ACHIEVEMENT AWARD NOMINEE Nina Bassett – Houston Alumnae Club Nominee - This award is presented to an individual alumna who has graduated college within the last 15 years. The young alumna has become an active Pi Phi alumnae member and demonstrated that Pi Phi is a lifelong commitment through their involvement in an alumnae club. REGION 4 CLUB OF EXCELLENCE Awarded to clubs that successfully perform the Criteria of Excellence. PREMIER CLUB 2nd Runner Up - Awarded to a club as representative of performance that is exemplary above all others. REGION 4 EXCELLENCE IN COMMUNICATION AWARD WINNER This award promotes and recognizes outstanding communication within an alumnae club based on internal and external communication. FOUNDATION TOP 10 ALUMNAE ORGANIZATIONS FOR GIVING 2nd Place - In grateful appreciation for outstanding contributions supporting education, leadership, literacy and philanthropy. CAROLYN HELMAN LICHTENBERG CREST AWARD NOMINEE Melissa Garlington – Crest Award Nominee for Professional Achievement - Distinguished individual alumnae are honored for personal achievement in areas of community service or professional achievements. EVELYN PETERS KYLE ANGEL AWARD FOR CLUB SERVICE NOMINEE Ann Johnson – Houston Alumnae Club Nominee - An alumna is recognized for having performed those duties that often go unrecognized but serve to enhance the success of an alumnae organization. EMMA HARPER TURNER LEADERSHIP AWARD CLUB NOMINEE Becky Herren - Houston Alumnae Club Nominee - Awarded to an individual alumna for exceptional leadership that contributed to the success of her alumnae club on the local level. 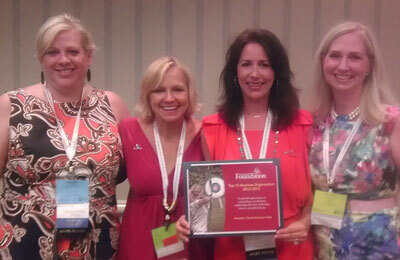 EXCELLENCE IN MEMBERSHIP & RECRUITMENT (LARGE GROUP) 1st Place - Houston Pi Beta Phi Alumnae Club has more than 35-percent of members that pay annual dues and participate in great programs, fundraising efforts and literacy events. REGION 4 EXCELLENCE IN COMMUNICATION AWARD WINNER This award promotes and recognizes outstanding communication within an alumnae club based on both internal and external communication. Special thanks to Lindsey Massengale, M.D., for her time and hard work. CAROLYN HELMAN LICHTENBERG CREST AWARD Ann Barnett Stern – Crest Award International Winner for Professional Achievement - Distinguished individual alumnae are honored for personal achievement in areas of community service or professional achievements. YOUNG ALUMNAE ACHIEVEMENT AWARD WINNER Leslie Fletcher - This award is presented to an individual alumna who has graduated college within the last 15 years. The young alumna has become an active Pi Phi alumnae member and demonstrated that Pi Phi is a lifelong commitment through their involvement in an alumnae club. 2014 ARROWMONT SCHOLARSHIP WINNER Congratulations to our scholarship winner, Terry Thompson. Terry is a retired Methodist minister who has just discovered his talent in painting and has already been commissioned to paint for others. EMMA HARPER TURNER LEADERSHIP AWARD CLUB NOMINEE Jackie Martin - Houston Alumnae Club Nominee - Awarded to an individual alumna for exceptional leadership that contributed to the success of her alumnae club on the local level. EVELYN PETERS KYLE ANGEL AWARD FOR CLUB SERVICE NOMINEE Linda Ittner – Houston Alumnae Club Nominee - An alumna is recognized for having performed those duties that often go unrecognized but serve to enhance the success of an alumnae organization. REGION 4 CLUB OF EXCELLENCE AWARD WINNER Awarded to clubs that successfully perform the Criteria of Excellence. EXCELLENCE IN COMMUNICATION AWARD WINNER This award promotes and recognizes outstanding communication within an alumnae club based on internal and external communication. Special thanks to Joanie Sanders for time and hard work. 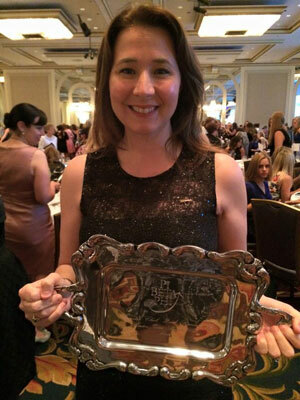 EXCELLENCE IN MEMBERSHIP & RECRUITMENT AWARD WINNER Houston Pi Beta Phi Alumnae Club has more than 35-percent of members who pay annual dues and participate in great programs, fundraising efforts and literacy events. EMMA HARPER TURNER LEADERSHIP AWARD – REGION 4 WINNER Suzanne Gerum Stiles - Houston Alumnae Club - Awarded to an individual alumna for exceptional leadership that contributed to the success of her alumnae club on the local level. CAROLYN HELMAN LICHTENBERG CREST AWARD WINNER Becky Foster Crane – Crest Award International Winner for Professional Achievement - Distinguished individual alumnae are honored for personal achievement in areas of community service or professional achievements. EVELYN PETERS KYLE ANGEL AWARD FOR CLUB SERVICE NOMINEE Charlotte Ulrich Schillaci – Houston Alumnae Club Nominee - An alumna is recognized for having performed those duties that often go unrecognized but serve to enhance the success of an alumnae organization. YOUNG ALUMNAE ACHIEVEMENT AWARD NOMINEE Darcy Stingerie – Houston Alumnae Club Nominee - This award is presented to an individual alumna who has graduated college within the last 15 years. The young alumna has become an active Pi Phi alumnae member and demonstrated that Pi Phi is a lifelong commitment through their involvement in an alumnae club. 2013 HOUSTON ALUMNAE PANHELLENIC FOUNDATION SCHOLARSHIP AWARD WINNER Kelly Taylor, Kappa Alpha Theta, University of Georgia. 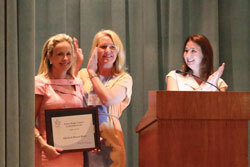 The Houston Alumnae Panhellenic Association (HAPA) Scholarship given in honor of Co-Presidents Barbie Dexter and Lindy Stockdale. 2013 ARROWMONT SCHOLARSHIP WINNER Genie Thompson - Congratulations to our scholarship winner, Genie Thompson. Genie is an artist and former teacher. EXCELLENCE IN COMMUNICATION AWARD This award promotes and recognizes outstanding communication within any alumnae club based on internal and external communication. CAROLYN HELMAN LICHTENBERG CREST AWARD WINNER Martha Kaiser Justice – Crest Award International Winner for Professional Achievement - Distinguished individual alumnae are honored for personal achievement in areas of community service or professional achievements. EVELYN PETERS KYLE ANGEL AWARD FOR CLUB SERVICE NOMINEE Pat Gres Shuford – Houston Alumnae Club Nominee - An alumna is recognized for having performed those duties that often go unrecognized but serve to enhance the success of an alumnae organization. EMMA HARPER TURNER LEADERSHIP AWARD NOMINEE Martha Dieste Voss - Houston Alumnae Club Nominee - Awarded to an individual alumna for exceptional leadership that contributed to the success of her alumnae club on the local level. YOUNG ALUMNA ACHIEVEMENT AWARD NOMINEE Chelsea Townsend Purifoy – Houston Alumnae Club Nominee - This award is presented to an individual alumna who has graduated college within the last 15 years. This young alumnae has become an active Pi Phi alumnae member and demonstrated that Pi Phi is a lifelong commitment through their involvement in an alumnae club, positions on an AAC and/or CHC and the many other opportunities through local community leadership. ARROWMONT SCHOLARSHIP WINNER Rita Ann Reyes - Congratulations to our scholarship winner, Rita Ann Reyes. Rita is a student at St. Thomas University. HOUSTON ALUMNAE PANHELLENIC FOUNDATION SCHOLARSHIP AWARD WINNER Haley Howell, a Zeta Tau Alpha collegian at The University of Texas at Austin. This award is given by The Houston Alumnae Club of Pi Beta Phi and The Houston Pi Beta Phi Foundation in honor of Kath Boles and Suzanne Stiles. AWARD FOR EXCELLENCE IN MEMBERSHIP More than 600 category Recognizes successful membership initiatives as evidenced by performance in numbers of dues paying members with respect to percent of potential members and the greatest increase. EXCELLENCE IN COMMUNICATION AWARD This award promotes and recognizes outstanding communication within an alumnae club based on internal and external communication. FOUNDATION TOP 10 ALUMNAE ORGANIZATIONS FOR GIVING In grateful appreciation for outstanding contributions supporting education, leadership, literacy and philanthropy. CAROLYN HELMAN LICHTENBERG CREST AWARD NOMINEE Lynn Harrison Baird – Crest Award Nominee for Professional Achievement - Distinguished individual alumnae are honored for personal achievement in areas of community service or professional achievements. 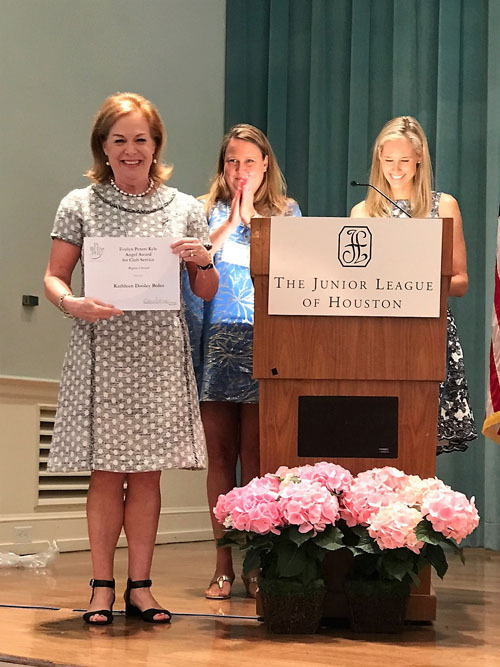 EVELYN PETERS KYLE ANGEL AWARD FOR CLUB SERVICE NOMINEE Martha Kaiser Justice – Houston Alumnae Club Nominee - An alumna is recognized for having performed those duties that often go unrecognized but serve to enhance the success of an alumnae organization. EMMA HARPER TURNER LEADERSHIP AWARD NOMINEE Barbie Timanus Dexter - Houston Alumnae Club Nominee - Awarded to an individual alumna for exceptional leadership that contributed to the success of her alumnae club on the local level. ARROWMONT SCHOLARSHIP WINNER Ella Park - Congratulations to our scholarship winner, Ella Park. Ella is a teacher at Woodrow Wilson Montessori School. HOUSTON ALUMNAE PANHELLENIC FOUNDATION SCHOLARSHIP AWARD WINNER Mary Meister, a Pi Beta Phi collegian at LSU. This award is given by the Houston Alumnae Club of Pi Beta Phi and the Houston Pi Beta Phi Foundation in honor of Jackie Dienna Martin.